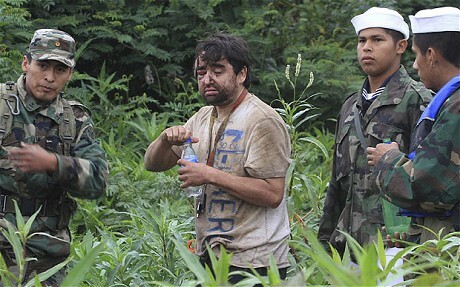 The sole survivor of a plane crash in Bolivia stayed alive by eating insects, drinking his own urine and painting an arrow in the ground with his blood to show rescuers where he was, according to an interview published in a Bolivian newspaper. Minor Vidal told the publication La Razon that he survived for 62 hours after the crash by using skills he had learned from the Boy Scouts and while pursuing his loves of camping and fishing. Those actions included filtering water through his clothes so that he could drink it and looking for an open space by a lagoon where he waited for his rescuers. The 35-year-old pharmaceuticals and cosmetics salesman was travelling on an Aerocon flight from the eastern Bolivian city of Santa Cruz to Trinidad in the Amazon when the plane went down on Tuesday night. Vidal said he was seated in the back of the plane and found himself trapped amid the wreckage. He was seriously injured in the head and the ribs but remained conscious. Eight others died in the plane crash. After crawling out of the wreckage on Wednesday, Vidal said, he drew an arrow with his blood in the ground to indicate the direction he had walked in. He also left his shirt in another spot as a sign for his rescuers. A navy patrol boat spotted him on Friday on a river bank. Seasonal fires set by farmers and ranchers had reduced visibility at the time of the crash. Aerocon spokesman Nelson Kinn said the plane’s black box has been recuperated and sent to Brazil for analysis.